When figures show that more than 60 percent of the top 100 crypto projects do not have a finished product and that over 800 cryptocurrency projects have failed, it’s easy to be skeptical about all things crypto. 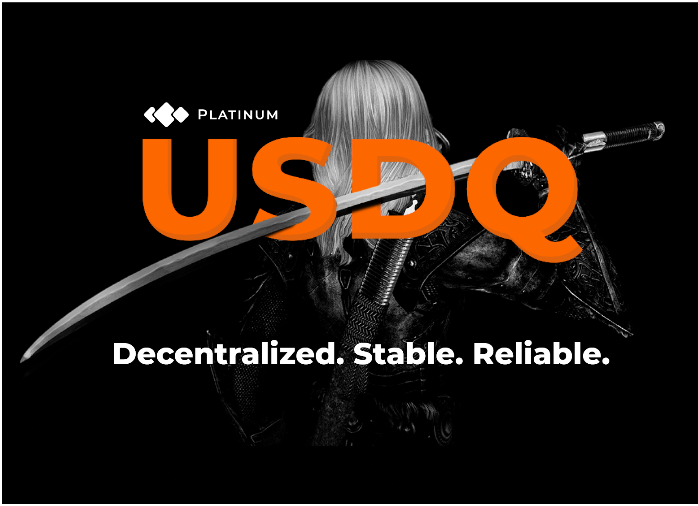 Among the thousands of coins available in the crypto market, a very few can live up to their promise to ‘revolutionise’ the financial system. One of the revolutionary few, however, isDigiByte [DGB]. DigiByte is thriving because it is more than a cryptocurrency; it is a coin designed to build a new internet through decentralization. DGB has one of the strongest use cases in the cryptocurrency market. It can support over 48 million transactions a day̶10 times the current transaction capacity of the top 50 blockchains by market cap. Ranked within the top 50 cryptocurrencies by market cap, DigiByte celebrated its 5th anniversary last January and has become the largest, fastest and most secure blockchain in current existence. Behind the development of DigiByte is a team with a forward-thinking approach, constantly working to improve the token and to ensure the best use case for a multitude of financial services applications. The newest features in DigiByte are Digi-ID and DigiAssets, both built on the highly secure DGB platform that allows decentralized technologies to be applied to digital identity and safe management of digital assets. Digi-ID is extremely secure because it automatically generates a unique identification key for different websites every time the user logs in, therefore protecting the user’s identity from being shared with third parties. Digi-ID comes fully integrated into DigiByte mobile wallets, which are free to download and use. It can also be implemented into multiple platforms including mobile banking, streaming services and social media. Digi-ID works before unlocking, making logins much faster. In addition to Digi-ID, there is new DigiByte product using DGB Pay API, expected to be announced in February. Beyond the DigiByte realm, its platform is being deployed now to develop Antum and V-ID, two promising projects powering blockchain to provide verification and digital identity services. 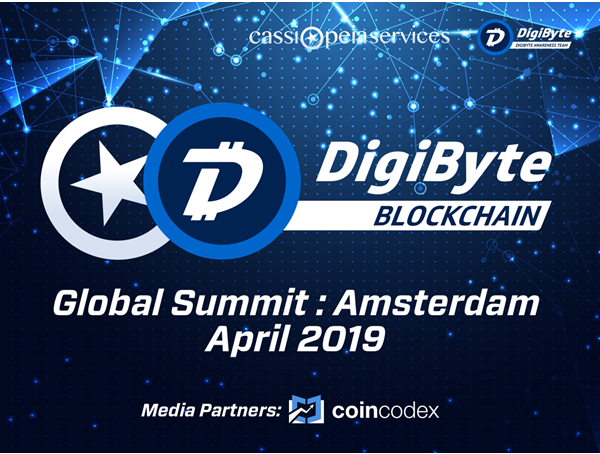 The DGB community and enthusiasts can expect more news and updates on DGB projects to be released during the first global DigiByte Summit, taking place in Amsterdam on 19th April 2019. More than just highlighting the benefits of blockchain applications, Tate’s book will build the case for blockchain technology to be integrated within the fundamental internet structure. Blockchain represents the evolution of the internet whose initial concept was indeed decentralization. “The new era of decentralized power is shaping our economy and society empowering individuals while increasing their responsibilities, challenging traditional institutions and the current security framework, driving innovation towards a tokenized economy,” comment Steffy (Stefania Barbaglio), official PR at DigiByte. This is a result of the development and integration of new technologies, the hyper-connectivity brought by smart devices, big data and the internet of things. “ In the future, everything in our daily lives will be connected via the Internet of Things (IoT) devices. Blockchain technology can protect your data and your privacy from this,” said DGB Founder Jared Tate. 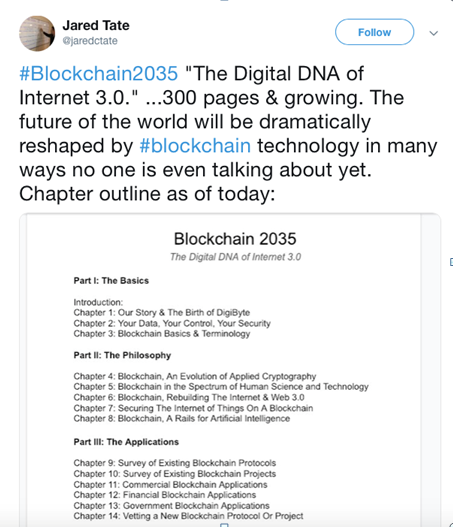 His book is expected to be one of the main publication in the crypto/blockchain space. In light of this topic, the theme of the DigiByte Summit 2019 is ‘The Power of Decentralisation’ and its agenda will expand on the multitude of possibilities and uses allowed decentralized technologies. 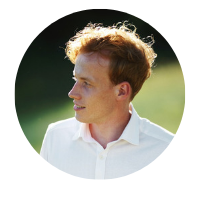 Confirmed speakers at the Summit include DigiByte founder Jared Tate; Official DigiByte PR Stefania Barbaglio; Rudy Bouwman, the founders of DGBAT, the DigiByte Awareness Team; and the founders and lead developers of V-ID and Antum. Tickets can be purchased here at the official website!